Nintendo announced two new colors for its handheld console, Nintentdo DS. 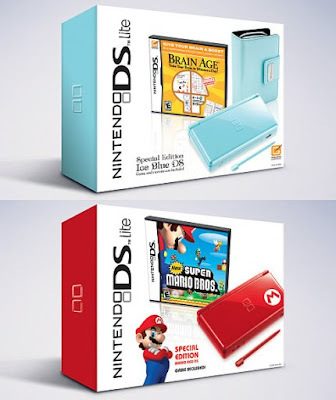 The new colors include a red edition bundled with the Super Mario Bros game and a new Blue edition bundled with the Brain Age. Nintendo, as always, is playing her Christmas Card for announcements, new bundles and offers to get more consumers drooling over old-revamped products. Last year's bundles included the Zelda Phantom hourglass game and Nintendogs who in their right mind would buy a new DS just for the color? It is not like they have added extra capabilities. All I know though, is that Nintendo knows better since DS has sold more than 80 million units world wide and that is no small feat. I guess there are always new consumers out there who still haven't got the DS console which, as Nintendo Wii, revolutionized console gaming.